Hubris Sonic: "Short Iraq Update"
BAGHDAD (AP) A raging, daylong battle erupted in central Baghdad on Tuesday and four Iraqi soldiers were killed, 16 U.S. soldiers were wounded and a U.S. helicopter was hit by ground fire at the close of the second month of the massive security crackdown on the capital. The resumption of violence was in stunning contrast to Monday, when a 24-hour driving ban left the capital eerily quiet on the fourth anniversary of its capture by American forces. But just hours after the ban was lifted before dawn Tuesday, artillery fire echoed across the city. 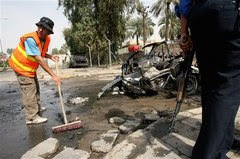 By day's end, at least 52 people were killed or found dead nationwide in strife confined mainly to Sunni enclaves. The U.S. military announced the weekend deaths of 10 American soldiers, including six killed on Sunday. These and all the other little tales leaking out of Iraq are showing to me at least that the initiative is still in the insurgents hands all that Cheney Bush has done is increase the level of tension requiring more grease to keep things moving between the players here, in the form of blood. With the currently visiting Tokyo Iraqi PM still refusing to give a goal date for the Iraqi army being ready to take over security or be involved to any degree. I think we looking a more of hard slough and probably have to re-re-re-take Baghdad, its going to be one hot summer. Robert Fisk: Divide and rule - America's plan for Baghdad Revealed: a new counter-insurgency strategy to carve up the city into sealed areas. The tactic failed in Vietnam. So what chance does it have in Iraq?